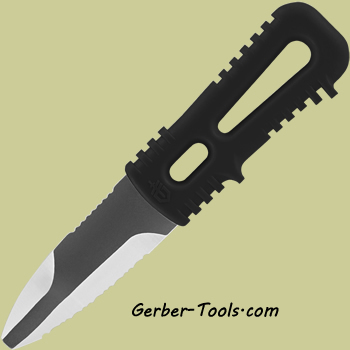 Gerber River Shorty Black 30-000967. This water sports knife utilizes a sturdy 3 inch blunt tip blade that has a half serrated blade. Nice jimping on the blade too. The handle is open, light weight, nice finger grooves, and made of black glass-filled nylon. Overall length is 6.75 inches. Comes with a molded sheath that attaches to a Personal Flotation Device, pack or belt. Made in the USA.